A report published by Microsoft Research has described an Integrated Display Cover for use in conjunction with a regular smartphone. The Display Cover would offer users an additional e-ink display for viewing information, thus increasing the amount of screen real estate available. Concept images of the cover were shared on Twitter. Microsoft Research has published a file called “Demo: Enhancing Smartphone Productivity and Reliability with an Integrated Display Cover.” The report describes a Display Cover that incorporates an e-ink screen that can be used to offer consumers a further option for reading information. The cover does not have touch functionality, but it does come with five touch buttons at the bottom for performing operations. According to Microsoft, interface circuitry is added to the rear of the smartphone in use, which is connected to the Display Cover via flat-flex cables. The secondary display can have information pinned to it for rapid access, freeing up some resources on the primary display for alternative functions. 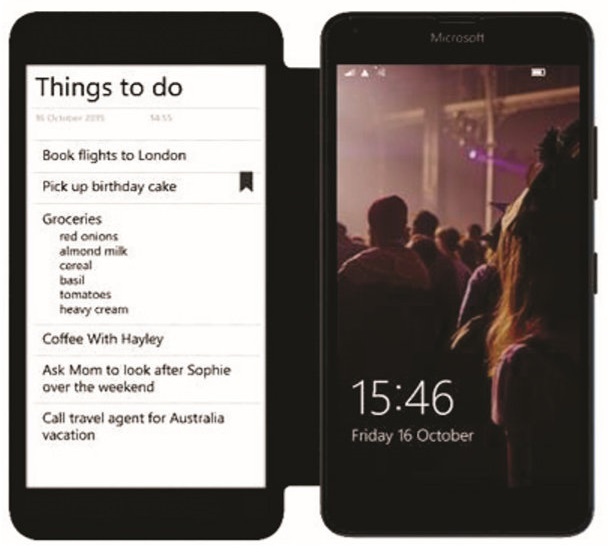 Microsoft Research offers potential usage scenarios for the Display Cover such as saving a to-do list, displaying e-tickets, and performing as a digital assistant. The pictures shared on Twitter show the Display Cover’s potential versatility, with the additional screen real estate being used to assist with tasks from writing texts to cross-referencing facts. 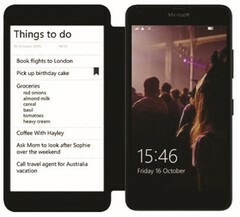 However, the Microsoft Research Display Cover prototype does not yet have the e-ink touch overlay that some of the above tasks would likely require. But it does still provide a considerable step-up from a normal leather/plastic non-functioning run-of-the-mill smartphone cover. It’s not the first time Microsoft Research has focused on this kind of technology though; the division seems to have been chasing this idea for some years now.